We spend a lot of time talking about how the bride should look her best on her wedding day. Obviously, the same goes for the groom… you’re going to want to look hot! You should feel comfortable, handsome and confident when you say “I Do” to your beloved. We know it can be difficult to decide on what you should wear on W-Day, so let us help you choose the perfect attire. The first step to choosing your attire is communicating with your bride to be. While you don’t have to tell each other exactly what you are planning on wearing, you should co-ordinate in your styles. If you are going for a formal and majestic event, then wearing casual beach wear will not work. Equally, for a relaxed, rustic wedding, a tux will look out of place. A black tie instantly denotes James Bond in a tux. This is a great option for a smarter wedding. However, bear in mind that “Black Tie” doesn’t always mean tux, it can also be a smart black suit. The difference is that a tux will have a satin feel to it, with buttons and lapels covered with the material. This is another smart option, involving a jacket, waistcoat and trousers. 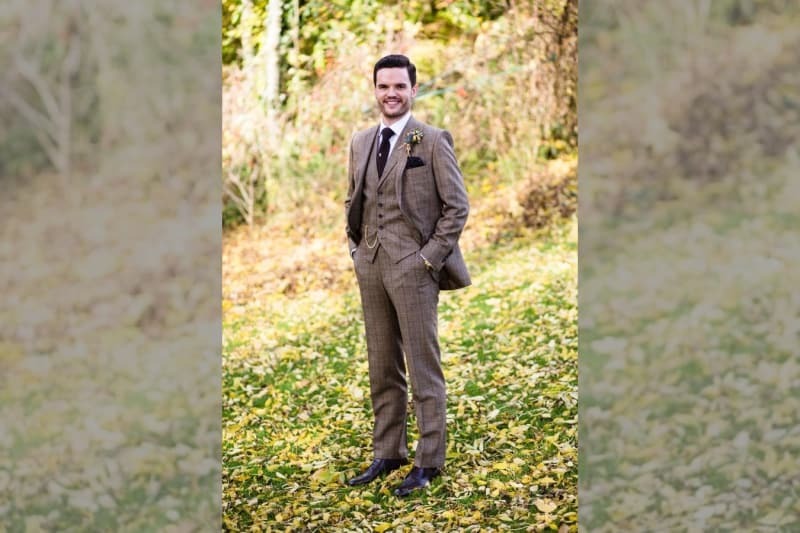 A lot of grooms are choosing to inject some personality into this by choosing different colours and textures, ranging from deep burgundy to tweed and adding fun accessories, like pocket watches. This is a very flexible option, as it can be dressed up or dressed down. Similarly, it is great because it can be worn again and again. This can really mean anything, from jeans dressed up with a blazer, to Bahama shorts and a smart shirt. 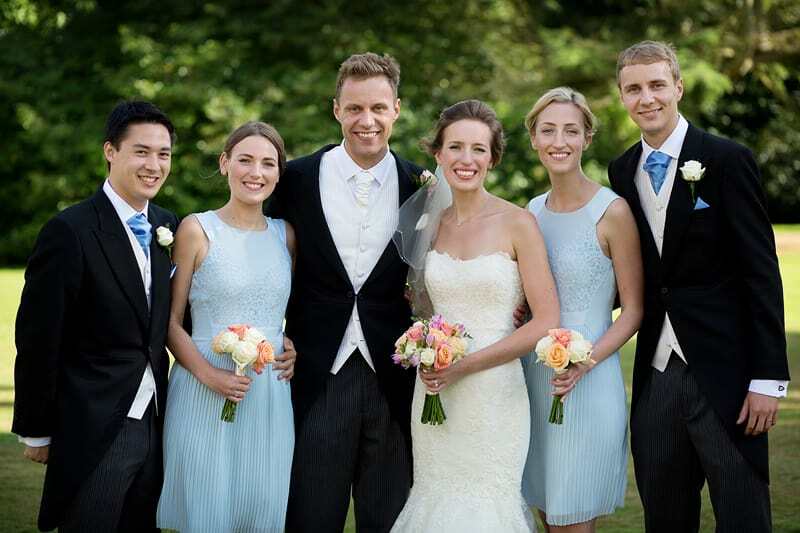 Casual attire allows you the most flexibility, but make sure that it is appropriate for the style of your wedding. You can accessories your suit with a bow tie, a cravat, or a long tie, or no neckwear at all! 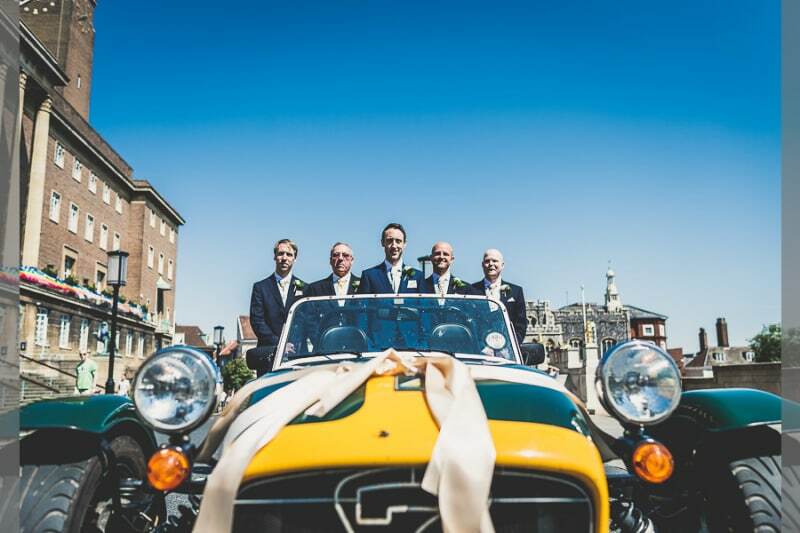 If you are going for the no neckwear option, make sure you still look dapper with an upright collar, kept in position with a nifty pair of magnets, like those at stiffies.co.uk (you get 20% off if you use the code ‘bridebook’ too!) It is also becoming increasingly more popular for grooms and ushers to play around with colour pocket handkerchiefs, socks and braces, which can be used to tie the bridal party and the ushers together for a more cohesive look. First of all, make sure you choose the right shop! Not all places are the same when it comes to choice, tailoring and quality. The best shops will have a huge range of suits and tux’s to choose from and they will stock the latest fashions, which will include accessories. Make sure that when you are going to buy, you go to someone who knows exactly what they are doing. Secondly, don’t assume that all suits/tuxes/ties look the same. Instead, you should listen to the professionals who will help you choose something that flatters your shape. Whether it is a different lapel, a wider tie, or the number of buttons on your jacket, make sure you try a variety of styles before settling on the one that you feel best in. Don’t ignore the quality of the materials either, especially if you are buying. Cheap materials will look cheap in photos and won’t stand the test of time. Lastly, if you are renting, make sure you read the small print. You will want to know all the details regarding the timings for the returns and cleanings, so that you aren’t faced with any unexpected charges or admin during your honeymoon! Don’t forget about your budget! A cheaply priced suit does not always mean a bargain, as the quality could be poor and it could be almost impossible to alter. Similarly, while we encourage you to invest in a good quality suit when it comes to your wedding day, only invest in something that will be timeless and something that you will be able to wear again, otherwise the suit will simply hang at the back of your wardrobe. Second hand or rentals are fantastic options if you are looking to save some pennies. The width of your tie should match the width of the lapel. Your jacket should fit comfortably around the neck and shoulders and it should be easy to fasten. Your shirt should be comfortable around the waist, neck and shoulders. For a formal look, it should be half to a quarter inch longer than the sleeve of your jacket. If you are wearing a waistcoat, it should line up with your jacket at the front and the bottom should just overlap with the waistband of your trousers. The hem of your trousers should be on level with the tops of your shoes and they should feel comfortable when you sit down. You should always try on your bow tie before you buy it! It should feel comfortable and snug around your neck. When looking for shoes, always make sure that they fit you comfortably. If they are new, get your best man to rub a bit of sandpaper on the soles so you don’t go sliding about. Try on your formal wear two days before the wedding. This way, you can make sure that everything still fits properly and any last-minute adjustments can be made. We recommend you advise your ushers to do the same! Lastly, your belt should always match your shoes! 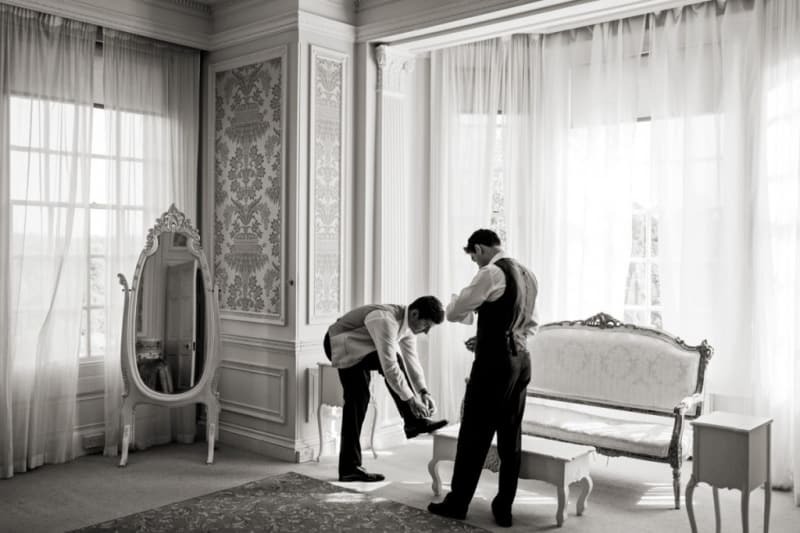 Your ushers will be by your side, helping you throughout your wedding day, so you want to make sure they look their best too! While all of the above tips can be applied to them, there are a few separate things you should know. First of all, they don’t all have to match you or even each other! Just like bridesmaids can sport different shades and patterns, so can your ushers. So long as they stand out amongst the wedding guests and they look like a cohesive part of the wedding party, you are fairly unlimited in deciding what they should wear. 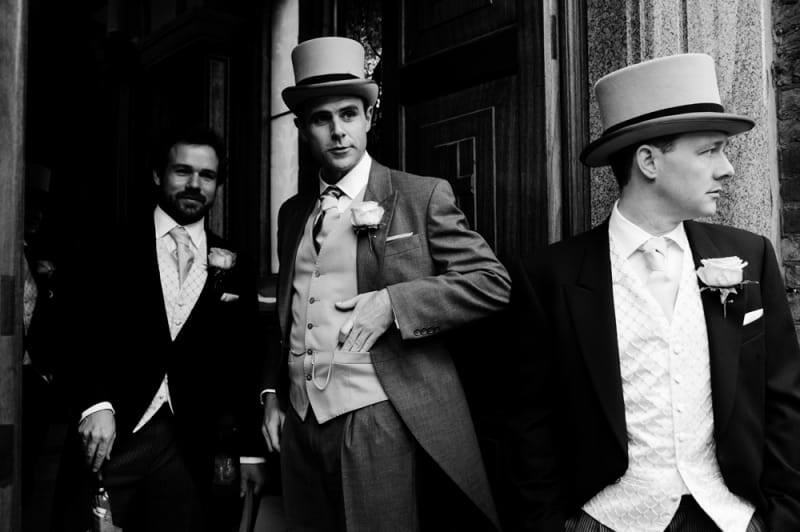 Secondly, it is no longer custom for the groom to pay for the ushers’ outfits, they can buy their own or choose something that they already own, providing it fits with your general look. However, if you can afford to and want all of you to match, then it’s a nice treat to offer to pay otherwise a matching tie and button holes can do the trick!